Need help finding the right massage chair? It’s easy to feel overwhelmed, so this Buying Guide helps recommend the right massage chair for you. Below are a few questions to help get you started. And please feel free to call us (888) 612-8862 or "Chat with us" at the bottom of your screen. • "I'm looking for a specific benefit or feature." • "What's the best overall massage chair for my price range?" • "What are the best brands of massage chairs?" • "How does each feature actually benefit me?" • "Which massage chairs are on sale?" "What's the best overall massage chair for my price range?" - The Luraco i7 is the best massage chair acailable today. What’s the difference between L-track and S-track? What does 3D massage mean? In this section, we’ll explain how each feature actually benefits you. What do the features actually do? Click here to view chairs with Strong/Intense Massage. 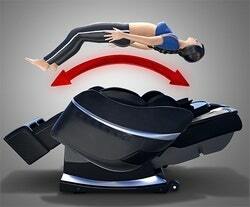 Zero Gravity refers to the reclined position seen in the diagram, where your legs are slightly bent. 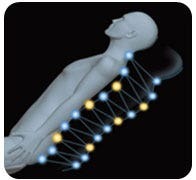 A NASA study determined this to be the best position to evenly distribute your weight, to decompress your spine, to reduce back stress and tension, as well as improving your circulation. This position also allows the massage rollers to give you a deeper massage. 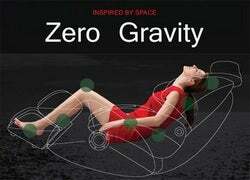 Click here to view chairs with Zero Gravity. Recently premium massage chairs have added the ability to extend the rollers into your back and retract them back into the chair. These are 3D massage chairs, and they provide the deepest massage since they can press into your back, just like a massage therapist would. So in addition to up/down and left/right, 3D massage chairs go in/out. This allows more control over the depth of your massage and will feel more like a human touch. 3D massage chairs will allow you to fine tune the massage from soft to deep tissue depending on the depth the rollers can extend into your back. This depth can range from 2.2 inches on some models to 4.7 inches on others. The body scanning ability of 3D chairs (ability to determine your shape, size, height) is also much more accurate and precise. Click here to view chairs with 3D Massage. 4D technology allows the massage chair rollers to protrude up to 3.5 inches further out. The result is that you get a more intense, deep tissue massage to loosen layers of muscles and soothe tension. You can easily select multiple intensity levels on the remote control to suit your preference. 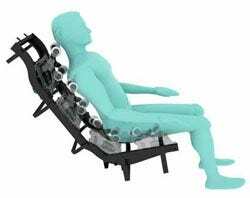 Click here to view chairs with 4D Massage. Heat therapy provides you with soothing back pain relief. Heat therapy dilates the blood vessels of the muscles, which increases the flow of oxygen and nutrients, helping to heal damaged tissue. This is a particularly enjoyable feature for those cooler months. 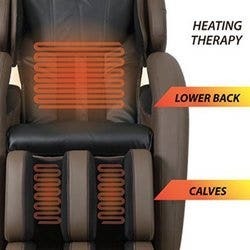 Click here to view chairs with Heat Therapy. Click here to view chairs with Foot Rollers. Body Scan Technology gives you the most accurate and precise massage, automatically customized for your specific body type. Body Scan works by using sensors and state of the art computing technologies to automatically detect the size, shape and curves of your body. And because the massage is tailored for your body, you won't even need to adjust any manual settings. Click here to view chairs with Body Scan. Like the S-track, the L-track works its way down from your neck, conforming to your spine’s natural shape. Although the S-track stops at your lower back, the L-track continues further to effectively massage your buttocks muscles and the top of your hamstring muscles. An L-track chair offers about 35% more range than traditional massage chairs. Click here to view chairs with L-Track. Click here to view chairs with S-Track. Stretch massage gently stretches your spine and legs. It is a very relaxing sensation, somewhat similar to waking up in the morning and stretching. But in this case, the massage chair does it for you precisely and throroughly. Click here to view chairs with Stretch Massage.